•Match the Fair Lands blocks with the illustrations of the blocks on the Fair Lands activity boards. •Classify the blocks by placing them on the activity boards. The goal in adding and subtracting in Two Land and Three Land is for elementary school students to learn to make and record fair trades. It is not to acquire expertise in base 2 and base 3 arithmetic, though this may occur. It is to understand base 10 numeration and learn addition and subtraction as ways of thinking rather than rote procedures. Students need to get past their natural excitement at first handling the blocks. Let students play and build with the blocks, perhaps for days and even weeks. When they can answer the following questions through their own investigations, they’re ready to work with the blocks. 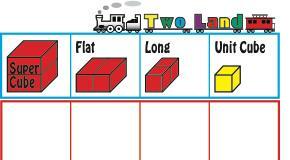 Students need to learn the names of the blocks and their placement on the Fair Lands activity boards. Click on the ones pictured on the right for copies you can print.